G eagerly invites me sit down beside him. This thing called reading partnerships that we’ve been working on? He’s got it. And he’s the kind of 5-year-old that loves having the teacher be his partner. And so I sit. Before I can even get myself acquainted with the text I’m being quizzed. “Do you know all the cars in Cars 1? How about Cars 2? I’m not sure if this last statement is true, but G clearly knows his cars so I don’t argue. His excitement in quizzing me is palpable, and so we begin. Him pointing at the picture of different cars and me throwing guesses into the universe. If there are 116, I only know a measley 4. Not impressive, but G encouraged me by naming all I did not know so I could learn. Turned to a page with roughly 20 cars on the spread ranging from big to small, he knew and pointed to every single one of them. 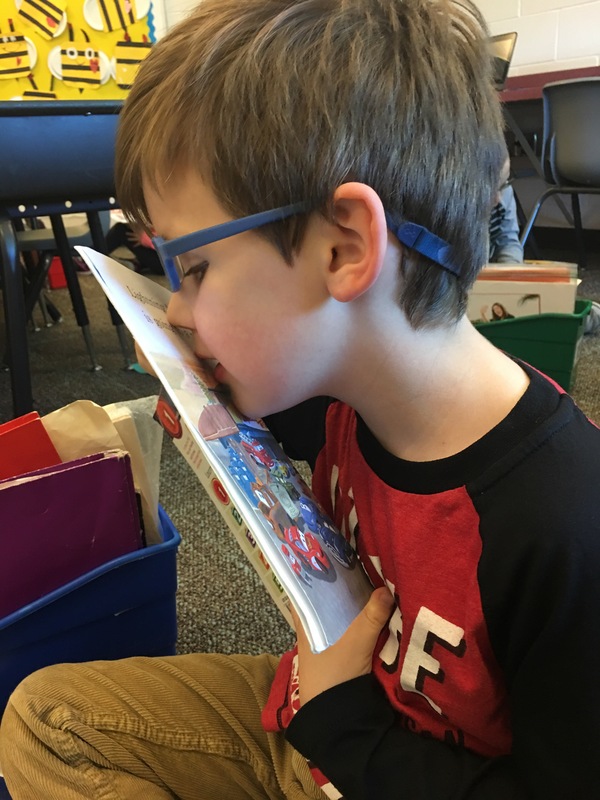 He reminded me to use the reading strategy, Picture Power, by pulling clues from the illustration to help me do this, and that could help me remember them, too. Pretty impressive for a 5-year-old, right? A kid teaching me reading strategies and the content of his text all at once. Any Kindergarten teacher will tell you this is a good day. What makes this moment even more incredible is that G is blind. 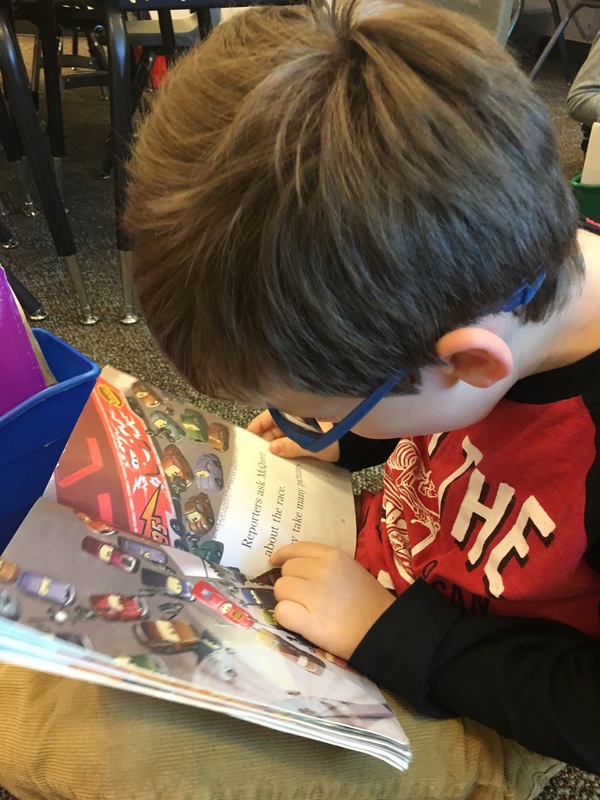 His book box is FULL of Braille books, but he chooses the traditional texts that match what his peers are reading. He prefers this. Why? When I ask him this same question, “The pictures, of course.” Of course. And he’s studied them all. 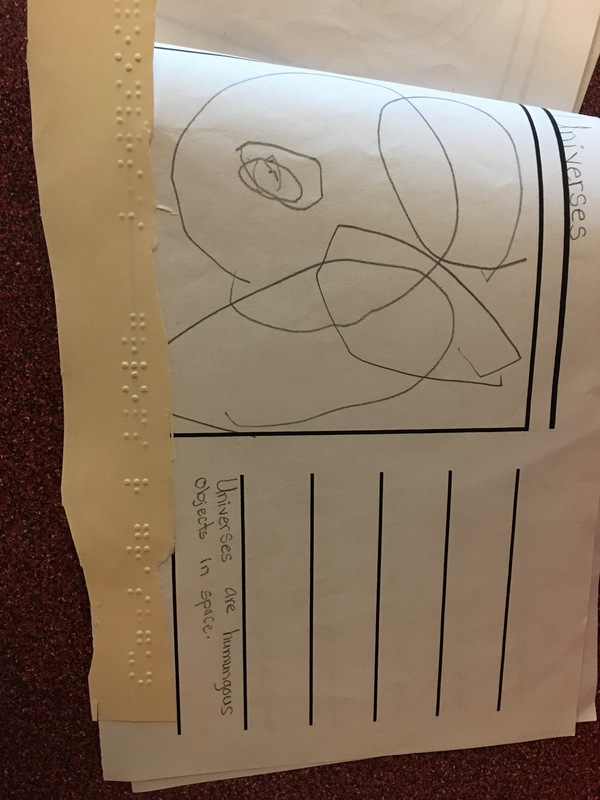 G has a 2-desk space in his classroom that allows for his Braille machine to be by his side at all times. Between this and his walking stick, G is a completely independent learner throughout the day. 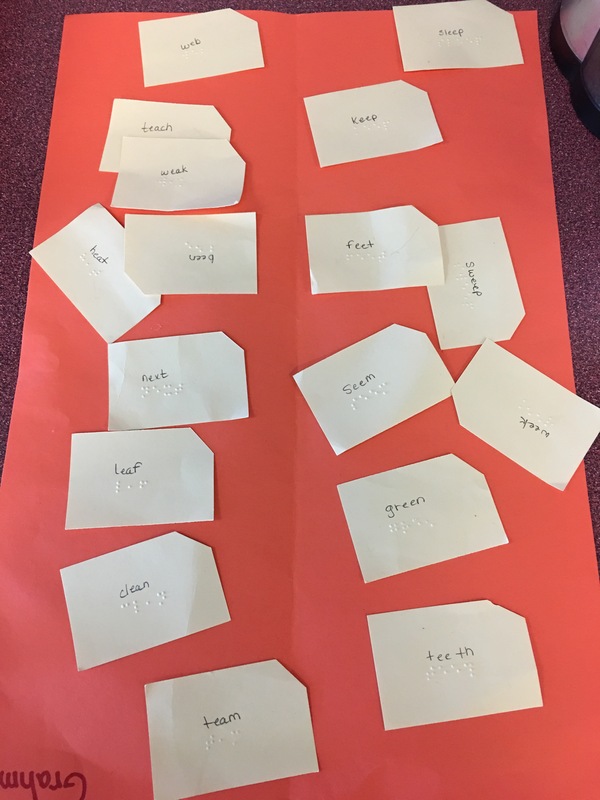 He does his writing and word study in Braille, but in reading it’s different. He’s different. He thrives on the color and added meaning he can build in the text through the pictures. So he challenges himself in this way. As he was trying to build the word Lightning McQueen, me kept getting tripped up on the loops hanging down from the g’s. They look like the g’s in the font I’m typing, so it looked to him as two little o’s atop each other. We worked through it. He didn’t give up. And so adds another layer to this incredible kid. Kindergarteners are also in the throes of learning their letter sounds and formations. The font in this text did not follow all the traditional letter forms that he’s been learning, but he foraged on. And so we read Cars, and the we read Cars again because it’s his favorite, of course. I tear myself to go meet with another student, but all I really wanted to do was sit and marvel at all G was doing as a reader and person. As I stand to leave he reminds to use Picture Power with the books I read and expresses his hope that we can read together again soon. Me too. I have another hope too. A hope that brave and bold are the words that continue to define him, not his blindness. He certainly hasn’t let it define him. Let’s hope the world can do the same.